During the 1988 slam dunk contest between Michael Jordan and Dominique Wilkins, Jordan made a move that made history. He used a full-court runway to take off from just inside the free-throw line, double-clutching his right arm and kicking his legs for the 15 feet between the charity stripe and the rim. It was one of the greatest high-flying slam dunk displays in history. From there, the Jordan brand took off. We were challenged by Jordan Brand to develop a digital initiative with a focus on greatness at the NBA All-Star weekend. We needed to pre-launch the Air Jordan III Tinkers, the latest version of the sneakers MJ was wearing, in a memorable and iconic way. We turned a moment that immortalized MJ in basketball history, into the most iconic shoe drop to ever go down. Starting with a replica of Michael from NBA 2k, and a team of 3D artists at SnapChat, we immortalized MJ’s icon slam dunk in Augmented Reality and released the lens around the world. 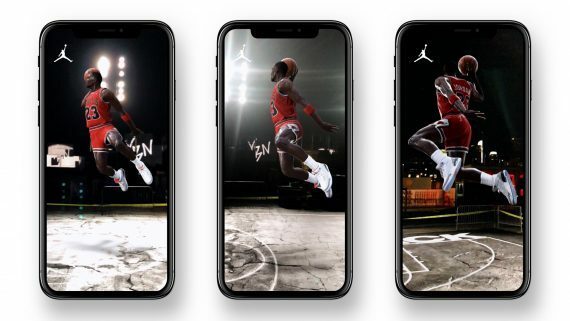 Using SnapChat, fans were able to shop the latest version of the shoes Michael was wearing, the Air Jordan III Tinkers, bringing e-commerce and SnapChat together for the first time ever. We pulled in four key players: NBA 2K who provided a 3D model of Michael Jordan in his iconic slam dunk pose, experience designers at SnapChat, e-commerce experts at Shopify and two-hour delivery venture company Darkstore who delivered the sneakers to fans in under two hours. The lens went live at the NBA All-Star weekend, and spread around the world. It was the first time that someone could purchase something on SnapChat, and the yet-to-be-released Air Jordan III Tinkers sold out in just 23 minutes. One snapcode reached 5.8 million unique users. SnapChat registered 4x the normal user engagement on their platform – unprecedented performance in the history of the brand. For the first time ever, we brought e-commerce and SnapChat together making it possible for someone to purchase a pair of sneakers on the platform. They sold out in just 23 minutes.